El-Zakzaky: Shiites Speak On ‘Plan’ To Unleash Terror In Kaduna. 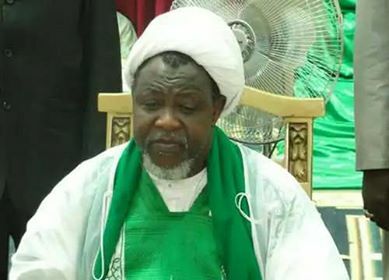 The Islamic Movement in Nigeria (IMN) has called on the general public to disregard the “fake news” being spread on social media that it intends to carry out “big attack” in Kaduna on Wednesday, due to the arraignment of its Leader, Sheikh Zakzaky at a Kaduna state High Court. This was contained in a press release on Tuesday signed by Ibrahim Musa, the president of Media Forum of the IMN. Musa said: “The Islamic Movement in Nigeria cautions the general public about some false statements being circulated today Tuesday 10th July, 2018 among residents of Kaduna city that we are planning a “big attack” tomorrow during the trial of our leader, Sheikh Zakzaky at the high court. “One of the messages being circulated on WhatsApp reads: “Security alert. Kindly avoid Magajin garin and Kasuwa areas dis Wednesday 11th. D Zakzaky people are planning a big attack. Pass it on.” The IMN expressed sadness over the story, saying, “It’s a false flag message which we believe is being peddled by our detractors, the security agents inclusive. We have never staged any attack on anybody throughout our 40 year history.” “Even at the last sitting it was the security agents that attacked us and disturb public peace. We urge the public to disregard that devilish message and go about their businesses. We are peaceful as we have been for many years. “The truth of the matter is we don’t even have any plan to stage a peaceful protest in Kaduna tomorrow. This clearly shows that the messages were mischievously concocted to damage the peaceful reputation we enjoy among the public. “We are aware of attempts by the security operatives to turn our peaceful protests to violent ones by attacking us unconstitutionally. We will therefore like to assure the public that our history speaks for us, we are always the victims of forceful aggression. “We however wish to caution our oppressors to abide by the constitutional demands of allowing peaceful assembly and protest of citizens wherever and whenever. “We have never killed, maimed nor destroyed anybody’s property, and we will not start it now. All that we are saying and will keep on saying is FREE OUR LEADER SHEIKH ZAKZAKY,” the statement read.